Conversion of a Neo Geo beat 'em up. 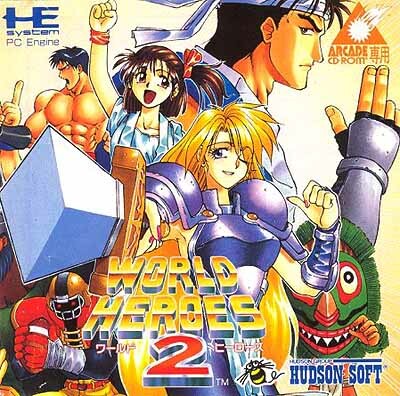 World Heroes 2, is a strange one - on one hand, this is a fantastic port of the Neo Geo original, leaps and bounds better than the SNES version, and more accurate. On the other hand, it's not the best Neo Geo fighter. Maybe there are reasons, but as SNK were churning out fighting games, trying to find their niche, they were clearly onto something with their other series. Maybe it was just timing, but I'd have loved to have seen a Samurai Shodown (II) port. Still, as fighting games go, it's easy to look back at the paths that Streetfighter II in particular paved, and to dismiss games like World Heroes II, but as you can see from some of the other fighters on the system, this one was actually really good for it's time, if a tad dated now. Big colourful sprites, and it's responsive, which you need. Not bad SNK, not bad at all.